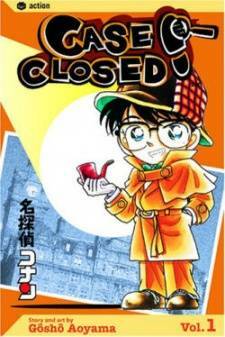 Scenario: Conan catches Ran leaving to go on a date with Shinichi. Conan, knowing it's a lie, follows her to a coffee shop where she admits to be waiting for someone else important. Ran leaves to buy some cake for Conan who stays at the coffee shop. A woman named Ivonna Marks is found murdered in the bathroom stall and four people are suspects to the crime. The police arrive and assume the criminal crawled above the bathroom stall to leave the scene, cutting down the suspects to two people. Conan notices that there's blood on top of the stall. He realizes how the murder occurred and drops subtle hints. The suspect Eri Kisaki picks up on the hints and reveals the murderer is James Tonga. She reveals that James strangled Ivonna then threw her over the stall. He then tied a rope to knife and stabbed her and pulled his knife back. 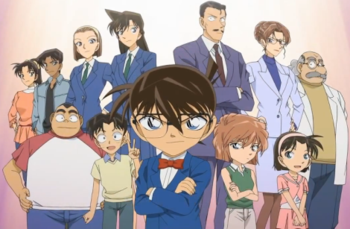 As evidence, Conan notices the bandages around James' fingers have switched hands, showing the bandages were used to strangle Ivonna and were tied to the knife to throw it over. It is revealed that James killed Ivonna in order to keep his affair with her a secret from his wife. Later Ran is revealed to have been waiting for Eri, her mother.